What is dark brown, crumbly, good for your garden and completely free? No, it's not chocolate cake. It's leafmould! Autumn leaves rot down to make leafmould. It is easy to make, and it can be used on any soil at any time of the year. It’s also perfect for seed and potting mixes too. Making leafmould is as easy as 1,2,3. One collect fallen autumn leaves. Two pack them while damp into a container – bin bag or wireframe. Three leave them for a year or two. You will have a lovely dark brown mix that supports your soil structure, can be used as a mulch, or as part of your potting mix. You can use all fallen leaves in the autumn. Even the ones with black spots. Running the mower over the lawn, with blades high, will collect a mix of grass trimmings and shredded leaves. These will rot down fast, especially when damp. You can also collect leaves from parks or cemeteries – but not woodlands. Leave them under hedges, not only are they good for the soil, but creatures such as hedgehogs may be hibernating there. Don’t use evergreen leaves - such as holly, laurel or Leyland cypress and other conifers - as they can take up to 3 years to rot down. Although pine needles can be gathered. Yes, they will take a long time to rot down, so keep them in a separate pile. But they produce acidic leafmould, which is ideal for mulching ericaceous plants, such as rhododendrons, azaleas, camellias, Pieris and blueberries. See below for the different types of leaves and their nutrients. Thick plastic bin bags are perfect. They are portable, allowing you to store them out of the way. Once full of leaves, make sure they are damp before tying the top. Pierce the bag a few times to help aerate the contents. See picture. If you have a lot of leaves you can make a simple heap. 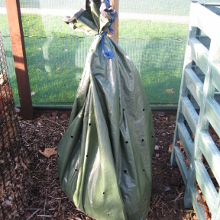 To stop them blowing away, build a frame round the heap using posts and netting. Small amounts of autumn leaves can be added to your compost heap. They make a good balancing ingredient for wet and soggy materials like kitchen waste. However, autumn leaves are rotted down mainly by the slow, cool action of fungi - rather than the quicker acting bacteria that work in a compost heap. This is why autumn leaves in quantity are best recycled separately in a leafmould heap. Young leafmould (1 or 2 years old): Leaves beginning to break up; easily crumbled in the hand. Well-rotted leafmould (At least 2 years old): Dark brown crumbly material, with no real trace of original leaves visible. Leaves contain up to 80% of the nutrients picked up by a tree. However, as they die, most of these nutrients are reabsorbed by the tree. What remains in the leaf is an important substance called lignin. It acts as a buffer for extremes of mineral flows within the soil, and can hold the soil nutrients in reserve. Lignin is also the fibre in the leaf's cell structure, and is slow to break down. This is worth remembering when gathering your leaves for leafmould. Leaves which are lower in lignin and higher in calcium and nitrogen: ash, cherry, elm, linden, maple, poplar and willow. If you mix grass cuttings with the leaves you will increase the nitrate content of the leafmould.